Joining the Utah Highway Patrol on January 7, 1974, Ray Lynn Pierson followed in his father’s footsteps. 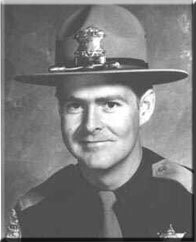 Sergeant Dean Pierson had been a member of the UHP since August 1959. Two days after transferring to his home town of Panguitch, Trooper Pierson stopped a pickup truck on highway 20. Trooper Pierson did not know that the vehicle was stolen and had just been involved in a gas skip. The driver produced a stolen .357 revolver and shot Trooper Pierson, striking him in the heart. Trooper Pierson managed to fire 6 rounds from his .357 service revolver as the felon sped away. The suspect was later apprehended by other officers. The suspect pled guilty to first degree murder on July 19, 1979. Trooper Pierson was 29 years old at the time of his death. He was survived by his pregnant wife, Darlene, two sons and a daughter.